North Thurston Kiwanis Club presents Up with People’s newest production, Live on Tour. 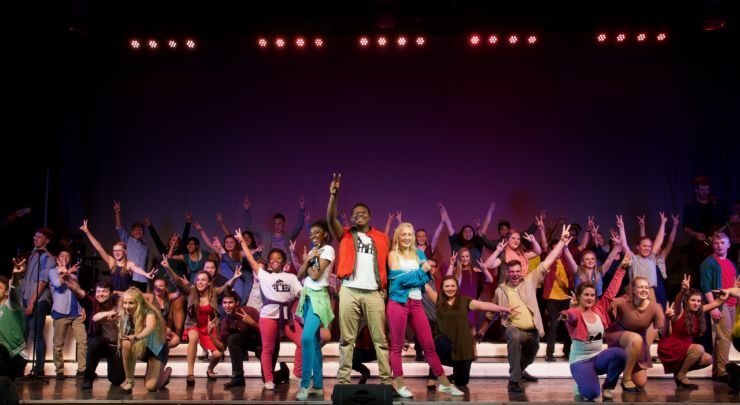 The performance focuses on our shared hopes for a better tomorrow and includes high energy international songs and dances, entertaining pop medleys, and original songs crafted to inspire people to make their own personal commitments to keeping hope alive in their communities. Kiwanis empowers communities to improve the world by making lasting differences in the lives of children. The Up with People show benefits Kiwanis Day of Champions in Thurston County. Day of Champions is a yearly modified track and field event to support Kindergarten through 12th-grade students with special needs in self-contained classes. The event also supports scholarships for graduating seniors with special needs who have participated in Day of Champion events. Up with People is building a more hopeful, trusting and peaceful world by empowering young people to be positive agents of change through action and the international powerful language of music. Participants from 20 countries travel to a new destination each week and throughout this journey, they strive to impact communities through host family stays, cultural exchange and 1,000+ hours of community service generally impacting 2,500+ youth per week! Up with People’s time in the community culminates with a two-hour professionally produced show that inspires audience members to think about what they will do to keep hope alive in their communities.